Recently my husband and I watched the film, The Danish Girl. The film stars Eddie Redmayne in a brilliant depiction of a man who wants to live as—and eventual to biologically be—a woman. Redmayne is brilliant and would probably have won the Oscar for best actor, had he not won it the year before for his performance as Steven Hawkings, the severely disabled physicist, in The Theory of Everything. The film is loosely based on the true story of an early 20th century Danish artist, Einar Wegener, later Lili Elbe. He gradually became a she, and lived as a lesbian couple with his wife in Paris. In 1931 she died after surgery in Germany attempting to transplant a womb into her body. The Memoirs are of a person who appeared to have been intersex, not transgender. For those of you who are still not familiar with these terms, intersex people are people born with both male and female organs (external or internal). Transgender people might also be intersex, or they could simply be people who “feel” themselves to be the other gender. Sometimes they live as the other gender without having surgery; other times they may also have surgery. In the case of Wegener/Elbe, the person on whose life The Danish Girl was based, s/he may also have been intersex, possessing residual ovaries. According to his memoirs, N.O. Body was born with ambiguous external genitalia. Her (as he then was) mother wanted to take the baby to a specialist, but her father refused. So she was raised as a female, despite the fact that both the household servants (who appeared to have been paid off) and other children noticed something odd about her. At the time of puberty, she developed an unusually deep voice for a female and also grew facial hair, while never developing breasts or menstruating. She also developed sexual feelings for females. Despite this, N.O. Body continued to live as a woman, taking a job in a city as a shop-girl but then, according to the story, becoming a reporter in Eastern Europe. There she met another woman and fell in love. Fortuitously, according to the story, she eventually met a doctor who examined her and confirmed that she actually was a man who needed a “simple operation” to clarify her/his external genitalia. She had this operation and returned to Eastern Europe to find her true love, who divorced her original husband and married her. Interestingly, as the Afterword by Hermann Simon explained, this story was also wrapped up in European anti-Semitism. N.O. Body claimed in his memoir to have been born into a Catholic family, but was actually Jewish. Her reporting assignment in Eastern Europe as Marie Baer was to investigate the Jewish “white slave trade” on behalf of a German Jewish agency. His true name was Karl M. Baer, and after he became a man he was the director of the Berlin B’nai B’rith until he left Germany in 1938. The “accidental” meeting with a doctor was actually a consultation with the great German-Jewish sexologist, Magnus Hirschfeld. The part about the love affair is true though. After she became a man, Baer returned to Eastern Europe and did indeed marry the woman he loved, although sadly, she died soon after. He remarried but never had children. Talk about intersex people and transgender people is hard for some people to wrap their heads around, and seems to go against the order of nature. As the United Nations Secretary-General Ban Ki-Moon said in a speech to the Human Rights Council, an organ of the UN, “I understand…like many people of my generation, I did not grow up talking about these issues.” He was firm in his insistence on human rights for people of all sexual orientations and gender identities, but tactful in the way he introduced this subject to people from many parts of the world where—as in my own parents’ generation in Britain and Europe—you simply did not talk about these things. (you can find the quote from Ban Ki-Moon in a brilliant article by my former student Elizabeth Baisley in Human Rights Quarterly, vol. 38, no. 1, 2016, entitled “Reaching the Tipping Point? Emerging International Human Rights Norms Pertaining to Sexual Orientation and Gender Identity”, p. 159). I have sometimes talked about homosexuality in seminars with human rights activists from various parts of the world, including Africans and Indonesians, Christians and Muslims. I’ve done this after being warned by colleagues not to do so. I’ve found that these activists are receptive to discussing these topics with me, perhaps because I don’t immediately blame them for not being as “enlightened” as liberal Westerners. I always think of my own parents and the views they held on such taboo issues. If I were to discussion intersexuality and transgenderism in future seminars, I would introduce the subject by referring to N.O. 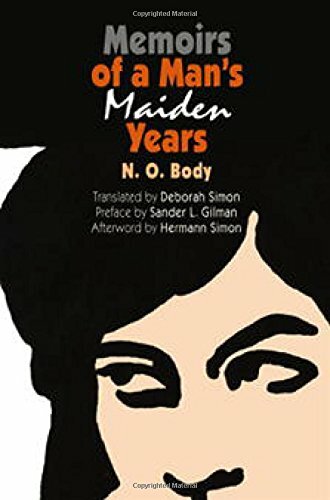 Body’s memoirs and to The Danish Girl.